Torrent trackers The Pirate Bay have had the authorities tightening the noose around their operations for years now, but this week things have taken a twist for the absurd/awesome. Last night, the group's existing domain, thepiratebay.sx (operating out of the tiny Caribbean hamlet of Sint Maarten), was seized by authorities. TorrentFreak speculates that the Dutch were behind it, both because a Dutch group has recently been spearheading efforts against The Pirate Bay, but also because Sint Maarten is a remnant of Holland's colonial adventures. Not that this has brought the famous site down. The Pirate Bay lives on at a new domain working out of the volcanic rock known as Ascension Island, a tiny British possession in the middle of the South Atlantic. While there's a certain romantic charm to picturing a bunch of Swedish nerds being holed up inside a volcano, holding out against paramilitary copyright enforcers, reality is sadly a little more mundane. 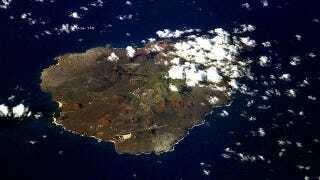 It's just the domain name that's based on Ascension Island, not the site's operations. And it's not staying there for long, either. As Ascension is under UK control, it's just a temporary stop, a Pirate Bay "insider" telling Torrent Freak that they'll likely be moving onto a more permanent home at a Peruvian domain. Or Dantooine. Or Yavin IV. Or Hoth.